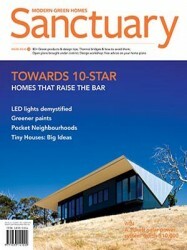 Sanctuary Issue 16 is out now! Protected from coastal winds and with great sea views, this modest South Australian holiday house couples design simplicity with passive thermal performance. Cape Jervis SA, Max Pritchard Architect. This family home underwent a considerable design reconfiguration to greatly improve functionality. Ascot Vale, Melbourne, VIC, Breathe Architecture. 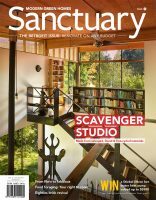 Building a sustainable home on a remote island off the US coast needed more than a touch of ingenuity. Criehaven, Maine, USA, Alex Scott Porter Design. This award-winning home demonstrates design for a comfortable lifestyle in the tropics – without air conditioning. Girraween, Darwin, NT, Troppo Architects. Building this stylish self-contained studio behind a Sydney house actually increased the size of the backyard.Sydney, NSW, Ben Giles Architect. The days of lead paint are long gone, but conventional paint can still contain nasties. Sarah Robertson explores the options for making your next painting project more environmentally friendly. LED lights have taken a huge leap into the mainstream in the last few years. The Building Designers Association of Victoria (BDAV) recently set its members a challenge to compete for the best 10-star home design award. Open-plan living has many benefits, but also potential drawbacks in loss of control over noise, heating and cooling. Heat conducted into or out of your home by frames, fixings and building materials can have a dramatic effect on its energy efficiency. The good news is that this thermal bridging can be avoided by careful design. Sanctuary subscribers Wade and April want their planned new home in Geraldton, WA, to take advantage of great sea views, be energy efficient and stay cool naturally. Sven Maxa of Maxa Design gives them some design tips. Small, tiny, micro – many ways to describe a movement which is becoming too big to ignore. Tiny House Movement. Close-knit community, increased sociability, playmates aplenty – the benefits of pocket neighbourhoods are many.